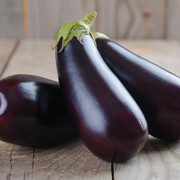 Eggplants, like many other vegetables, are great sources  of dietary fiber, a necessary element in any balanced diet. Fiber is essential for gastrointestinal health, as well as for regular bowel movements. It bulks up your stool so they pass more easily through the digestive tract, while also stimulating peristaltic motion, the contraction of the smooth muscles that help food pushed out of the body. Finally, fiber stimulates the secretion of gastric juices that facilitate absorption of nutrients and the processing of foods. I bought two beautiful eggplants a few days ago, and I’ve turned them into small frozen casseroles...with tomato, noodles and cheese. I was delighted to find that I’ve done my health a favor.